A little over three years ago I went through a retrospective phase and managed to sit down for several months and dedicate myself to writing about my life and experiences from childhood to the present day. Yes, it was therapeutic to a certain degree, but also a testament to things that have come and gone, things worth remembering. It is easy to grow nostalgic and sentimental looking back at the innocence of childhood, which can distort the objective recollection of the reality of the time, but this is not meant to be a historical piece. Fortunately my mum was a quite an avid amateur photographer. I recall her brandishing a fairly basic but decent Minolta film camera at birthday parties, festive occasions, early family vacations: basically whenever she deemed it an appropriate moment to capture the moment for posterity. This foresight has been an obvious boon to me now because these undoctored pictures are objective snapshots of the past. They capture smiles and moments of shared joy long forgotten and the details of scenes and places only sketchily remembered. My mum is some years departed now but I have spent many hours pouring over this collection of prints, negatives and early slides. I have inserted many of these into the text. I have written further chapters, some of which I may post, others probably not. If there is a school of thought whose belief is that one should only write about the past whilst keeping in the mind its implications for the future, then I would subscribe to it. Only someone approaching the very end of their days can really be forgiven indulging in nostalgia for its own sake. I was born in the UK , I would tell people with a certain satisfaction; Hammersmith Hospital, London to be precise. I have no recollection of the place however, since my parents had returned to Harare shortly thereafter and registered my birth again. Fortunately, my mother retained my original birth certificate, the one which stated that my parent’s ‘usual address’ at the time had been ‘48 Kenilworth Road, Ealing’. Thus I was able to claim British nationality at a later date when I felt sure I would want to travel back to my country of birth. That was many years later, however. With my respective parents as a baby. Hammersmith Hospital, London. An early photo of my parents and me as a baby. London, UK. These two old dears, Nelly and May, were spinster sisters who doted on me. I have no real recollection of them and never met them again but used to write to them as a boy. They often posted a crisp £10 in a card on birthdays. My early childhood had been a happy one; we would all look back on those days nostalgically. The burden of the civil war between the ‘whites’ and the ‘blacks’ the decade before, in the 1970s, had ended after the Lancaster House negotiations. Multi-party elections had been held for the first time and a black political party had taken office in the new state of Zimbabwe. Like my childhood peers I was born on the cusp of the transition between Smith’s ‘independent’ Rhodesia and Robert Mugabe’s ‘independent’ Zimbabwe. I have no memory of the times before, nor the changing of the guard. My earliest memories involve our original house at 44 Warwick Rd, Greystone Park, Harare, a relatively recent development (at the time) in the low density, north-eastern suburban fringe of the capital. I look at this picture with a slight sense of nostalgia but also a bit of sadness. I can’t recall the scene, nor do I really know what my father was doing in army fatigues. So far as I know he never saw active service in Rhodesia but he must have had some basic training. He never spoke of it subsequently. This is the young me outside our front door on the steps leading down from the gravel driveway. I don’t remember the Peugeot behind me although it was a popular model on Zimbabwean roads. It wouldn’t surprise me if there are a few of them still knocking around the countryside. The Datsun 120Y I do vaguely remember. It was a spacious estate-type model useful for ferrying kids around in. Mum and I in the lounge of our early home. In my mind’s eye I can see my mother’s white bedroom dresser with its oval-shaped mirror; the pink lace curtains in the bedroom; the pied mongrel Trixie, a family pet, its tongue lolling to one side; the gravel driveway out front and my folk’s old Datsun 120Y station-wagon parked near where the front door once stood. I can also clearly remember my neighbours from across the road, the Turners; well, not Mr. Turner because he had died of appendicitis whilst I was very young, but his wife Mona and her old Afrikaans parents. The old man’s name was Tom, Tom van Graan to be precise. I don’t know why but his name has stuck firmly in my memory. Old man van Graan was probably already into his eighties at the time which would mean he was born somewhere around the turn of the 20th century. I recall him sitting there in his chair facing the glass doors to the patio and the tree-covered hills of Greystone Park that lay beyond. His face was lined and mottled in the way that some old person’s skin will become blotchy with age. His milky blue eyes would look out on a landscape that very few would then remember. He talked of hunting buffalo in that very valley, something that had impressed the young boy enormously. Even then in the early 1980s it was a fairly undisturbed urban fringe; the hill slopes were too steep and rocky to farm and the soils in that part of the valley were either dark and prone to being waterlogged, or stony and difficult to work. I remember seeing the occasional small duiker antelope on an early morning walk and there was all manner of snakes and small mammals that inhabited those parts. Only some twenty years later would the hungry urban masses tax the natural resources of the city more heavily than ever before through urban cultivation and wood-cutting especially. Back then and for many years after that, the valley and its surrounds held a special place in my heart. Later I would dream of extending our urban nature sanctuary to encompass the entire area. It was certainly considered highly desirable real estate and many of the nouveau riche had built their houses and mansions on the surrounding hills with superb views out over acres of farmland on the one side and attractive natural woodland on the other. Years later I would become friends with a girl, Michelle, whose father kept a small herd of impala antelope on their property on the flank of that very range of hills. Old Tom would have been pleased. A view of the veranda from where the swimming pool was to be built. Dan seated on the bedspread of my parents old bedroom with the cat (Tigger?). Mum supports a young Dan on her knee as I stand off to one side. The old floppy-eared Mongrel we called Trixie. The Catholic Church was part and parcel of my childhood. My mother was active in her faith. I’m not sure which Order these nuns are from or where in Harare we are. My mother was educated by the Dominicans. I have a vague recollection of the garden whilst a new glitter-stone swimming pool was constructed. Glitter-stone is a type of metamorphic slate-like rock with a high percentage of mica which gives it the ‘glitter’ in its popular name. It was mined in terrain near the Zambezi Valley, not far from the northern limit of Lake Kariba and was prized as a material for surfacing swimming pools and patios. Digging the pool had proved to be quite an undertaking since Greystone Park was so named for the prevalence of hard, grey dolerite, an igneous rock that originated from molten material injected as dykes and sills between the older greenstone-type rocks. The builders had to build fires on the raw, grey stone and then hose it down with cold water; the rapid thermal changes would fracture the rock and make it easier to cleave open with picks and chisels; it must have been intensely physical work. The rock was never wasted however, providing the building blocks for stone walls and rockeries. Dolerite and similar greenstone rock types are iron-rich and weather to give red, loamy soils, which are agriculturally productive and on which many of the country’s commercial farms were previously situated. My mother with baby Dan looks at a quite stunning orchid on the patio. Take note of the old, spreading acacia in the background. A view of our front garden in Greystone Park as it was in the early 8os. This was before the swimming pool and renovations to the house. This photo clearly illustrates how close to the surface the bedrock of grey dolerite was and the effort that must have been required to excavate the pool. The other thing I remember about the property from a young age were the trees. The previous owner had planted a variety of exotic specimens: silver oaks out front; pine trees along the fence line at the bottom of the property and also close to where the swimming pool was constructed; a purple-flowering Jacaranda tree outside my brother’s bedroom; a large spreading syringa with yellow berries next to it which had proved very difficult to remove entirely; and an enormous Kenya coffee tree on the road-side of the property which my father cursed for all the debris it shed into the swimming pool. Far older than any of these recent introductions was an ancient Acacia sieberiana, below the level of the swimming pool. It was a magnificent old tree with twisted limbs as thick as an average tree even at a height of ten metres or more and a huge fissured trunk which hosted a hive of bees for most of my childhood, despite the repeated efforts made by my parents to be rid of them. The crumbly, flaky bark was always covered in lichen and it flowered once a year in summer; numerous scented, yellow balls constituting the clumps of minute flowers. Later the tree would be covered by irregular, flat woody pods with loosely embedded pale green seeds which would rattle musically when shaken. Numerous birds would forage in the canopy of that tree and various goshawks and other raptors would alight there from time to time. There was also a line of Eucalyptus gum trees set a little further back in the greenbelt area which had originally been preserved as a bridal path through the northern suburbs. Only many years later would they be felled in the interests of preserving the adjacent wetland area. They were a common plantation species grown throughout the Highveld area of the country for timber. Dan and I reading our prescribed school books in our PJs. Dan and I in the back of the Datsun 120Y. Ivan enjoys tea in the traditional manner with the staff we employed. Blydon at left, probably Winnie on the right just out of the frame. A picture of us three brothers in the fairly new glitterstone swimming pool. My father in the midst of a crowd of splashing young boys at one of our birthday parties. Dan and Ivan playing cops and robbers on the patio. My childhood years were spent romping around the garden with my brothers Dan and Ivan and neighbourhood friends: Robbie Taylor from Coventry Road a few hundred metres ‘down the hill’; Rob Standsfield a few houses ‘up the hill’ and Ben Murray half a mile or so away in the latter direction. Ben was my earliest friend and the one I would be at school with all the way from infants through to when we finished sixth form prior to university. His aptitude was for gadgets and devices from a young age but he was academically talented in just about everything he put his mind to. Rob Standsfield was not one for books or learning but he was lean and muscled from a young age and always seemed to have the best selection of BMX bikes. Me and the others found it easy to wind Rob up and unleash his explosive temper, which of course was the whole objective. He lost his mum to cancer at a young age and he had some very verbal altercation with his father on occasion. I remember going through a face-painting stage which explains our unhealthy pallor. All of us that is except Robbie Taylor pictured here holding Foxie, our fox terrier. Robbie from ‘down the hill’ was the naughtiest of them all, driving all the mothers mad with his tricks and antics. With Robbie we would raid neighbouring vegetable gardens or take a ‘skinny dip’ in Geoff Reilly’s pool at the top of his road. “I know Mr. Reilly and he wouldn’t mind” a grinning Robbie would claim if any doubt was expressed. I have a clear recollection of Dan and Robbie playing squash naked on his custom-fitted squash court after a dip in his pool, leaving wet footprints on the expensive laminate floorboards. I’m not sure if Geoff would have been so happy with that had he arrived back home unexpectedly. Geoff had made a lot of money as an earthmoving contractor in the region and was one of the first in the neighbourhood to get a satellite dish. I remember my dad once getting up in the early hours of the morning to go and watch a heavyweight boxing match at Geoff’s place, along with a few other gents, beamed live from Madison Square Gardens in New York. That was before satellite dishes and digital decoders were to become commonplace in the mid to late 90s. My brothers and I also spent a lot of time in the company of our cousins from nearby Ballantyne Park, especially Dominic (born in the same year as me) and Justin (Ivan’s contemporary). Michael, the eldest, seemed to grow up faster than the rest of us. He was an academic high flyer who, after four years of senior boarding school, left to Canada on a scholarship and thereafter a degree at Harvard University no less. I remember collaborating with Mike once on drawing a magnificently illustrated eagle in a ‘Birds of the World’ type book for a children’s drawing competition. To my mind the results were never made public if the pictures were judged at all and both of us were gutted. I didn’t think of Michael as a competitor as he was a year and a half older, but I clearly remember my cousin faulting me for having too many interests. “You have to concentrate on one thing and become good at it” he had said as a youngster. Perhaps he had been right, thinking back. I loved collecting things, whether it were bird feathers, cards, stamps, rocks and pebbles, curiosities or Airfix model airplanes. Maybe it was this propensity for collecting all these things which had drawn criticism from my cousin. With Justin, Dominic and my brothers at Christon Bank, a Nature Reserve on the edge of town with good views and picnic spots. My mother was very arts and crafts oriented. She had hosted a play-group in our family garage when we were toddlers; happy days filled with paint and music and toys and all sorts of innocent nonsense. So too was Ben’s mother, Barbie. When at Ben’s house we never wanted for paper or paint or crayons or tubes of cardboard from which we could build aeroplanes or objects of our imagination. Likewise there were buckets of Lego and building blocks and marbles. Ben was an only child and after his parents split up and his father had moved to the UK he always had the best selection of toys. Both his parents had struck me, even then, as being rather arty and non-conformist. His father, an architect, had built the most unusual house consisting of a series of interconnected domed rooms with interesting acoustics and their garden was almost completely wild. It was a great place to play games of all kinds and Ben had hosted a memorable birthday party where he and his classmates had battled the length and breadth of the garden for military supremacy. It was also occupied by numerous unusual rusty metal sculptures his father had welded together from pieces of scrap metal. I remember Keith at those early birthday parties watching proceedings amiably through bespectacled eyes. It was he who had taken Ben and me on our first trout-fishing expedition to the Nyanga National Park, something that would become a favourite holiday past-time growing up. After he and Barbie had split up he had emigrated and it would be another fifteen years or so before I would see him again. Barbie had continued raising Ben as a single mother with her sometime boyfriend Rob Thompson, another architect, later accompanying us on the trips to Nyanga. In fact Rob had been the architect responsible for designing the extensions to my parent’s house at 44 Warwick Road. My best memories of Ben’s house on Rye Hill road were of the arts and crafts and playing in the garden that had been left wild. Our best achievement in the creative department had been the construction of a four-foot Iguanodon dinosaur out of cardboard boxes and egg cartons and painted green, for a school project. There is a picture of Ben and me standing proudly next to the finished article in one of my photograph albums somewhere. Like all children I had loved dinosaurs and loved sketching them as much as I loved sketching birds; an interesting correlation considering the undisputed evolutionary link now established between the two groups. Two families stick in my mind as being particularly closely associated with mine: the Hickman’s and the Davison’s. We had gone on a number of holidays together, one year to Mana Pools, a popular and scenic spot along the Zambezi River in the Zambezi Valley, often referred to simply as ‘the Valley’. I’d been sick on that excursion and whilst the others were out fishing or on a game drive I was confined to a camp bed in one of the tents. A troop of vervet monkeys had arrived on a foraging expedition and one had given me a tremendous fright when it had strolled casually up to my camp bed and jumped up onto the end of it out of curiosity. It was one of the few National Parks where one was able to camp in an area in the vicinity of big game that included lion, buffalo and elephant, but like many campsites around the country it was the scavengers who proved to be the real nuisance: monkeys, baboons and hyenas. It was not unusual for a hyena to chomp its way through a cooler box if it thought there was some tasty morsel inside. On that trip one had made a significant dent in a metal food box my parents had borrowed from friends back in Harare in which they had kept some pieces of fresh meat. Although it had not managed to penetrate the sturdy metal shell, the animal had shredded the outer leather padding, which had required replacing back in town, as well as deep scratches inflicted by its bone-crushing jaws in the metal casing itself. Another trip with the Davison and Hickman families had been to the other side of the country to Gonarezhou National Park. Gonarezhou translates as ‘Place of the Elephants’ in the local dialect. I don’t remember much from that trip but one photograph showed us boys (there would have been seven of us between the three families, no girls) and several of the parents in front of the famed Chilotjo Cliffs: stratified, red and yellow sandstone cliffs along the banks of the Runde River. There were also a number of photographs from the Zimbabwe Ruins near Masvingo which we probably visited on the outgoing journey to Gonarezhou or on the return leg. With the Davisons and Hickmans in Gonarezhou NP overlooking the iconic Chilotjo Cliffs. Atop Dennis’s Land Cruiser, Mana Pools NP, Zimbabwe. With the Hickmans,somewhere in the Eastern Highlands District, possibly Chimanimani. 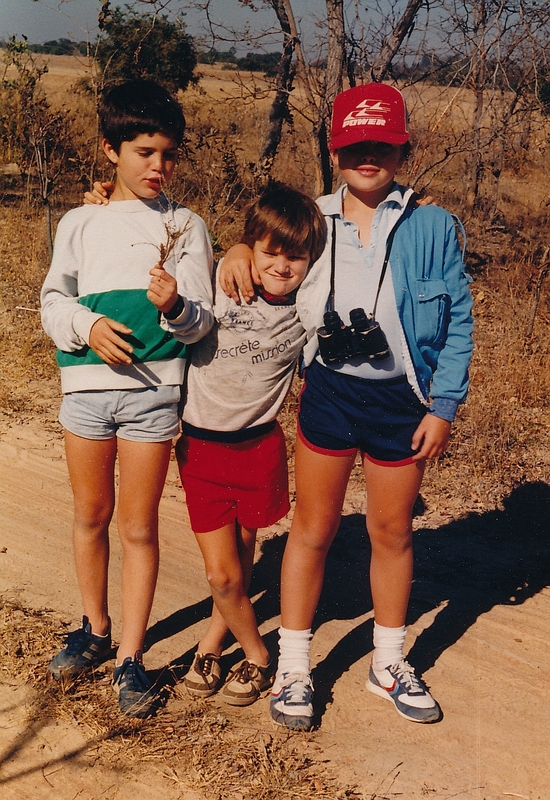 At Great Zimbabwe Ruins with my cousins near Masvingo, Zimbabwe. With Ben and Barbie I spent many a holiday at Rhodes Nyanga National Park and countless hours fishing for the plentiful rainbow trout in the Park’s dams, and occasionally the rivers too. There were occasions when I went with my own family and Dan had come along fishing as well, but it was with Ben and his mum that I went most regularly. The time that sticks out most vividly was when I got a fly hook embedded in my right index finger after trying to haul a fish onto one of the little wooden Parks rowing boats without a landing net. We had to return to Harare to have it removed by Dr. Pringle. Years later my mum had extracted the multicoloured fly, a Little Rainbow, from a compartment in her wallet. “Remember this?” she said with a smile and a flourish. I blanched: Could I ever forget? On a break at the Lake McIlwaine Recreational Park adjoining Lake Chivero (new name) with my older South African cousins, Grant and Brett. 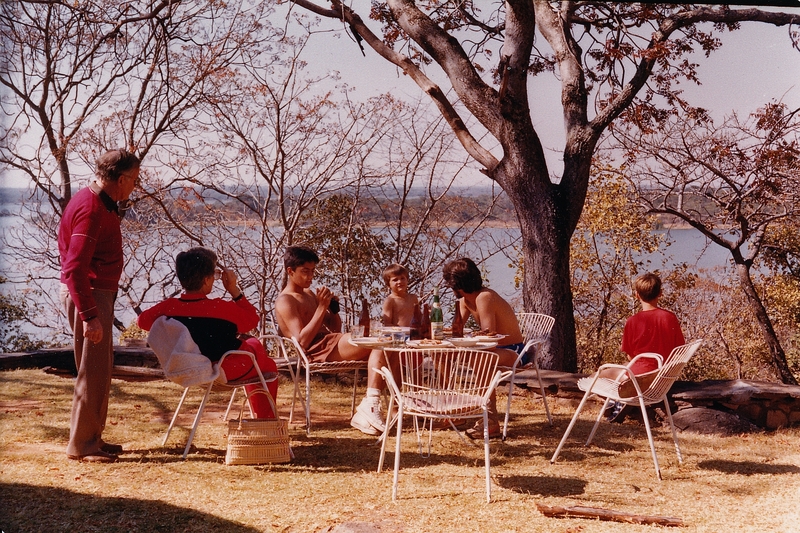 I don’t have much of a recollection of exclusive family holidays but there were a few occasions I recall when that had been the case; holiday outings to the chalets at Lake McIlwaine National Park just outside the capital amongst the best remembered. We’d gone on holiday there with my mum’s parents (my grandparents) and my Aunt Liz’s two boys, Grant and Brett. For Grant and Brett, raised in the city of Durban, it had been an eye-popping experience: feeding squirrels and rock dassies by hand and walking amongst impala, zebra, kudu and even the few white rhinoceros. The two older boys had loved it and would talk fondly about it years later. McIlwaine was a Recreational Park so, unlike Mana Pools, there were no lion, elephant or buffalo and one was free to walk anywhere within the Park. Only the white rhino could potentially maim or even kill. They could make short work of someone if so inclined but it was the black rhinoceros, native to the Zambezi Valley that was by far the more dangerous of the two species. My Uncle Paul (my mum’s brother) who spent his last few years in Zimbabwe just outside Harare at a place called Resthaven. Here he is outside his little bungalow. In later years my uncle Paul, who had served with the Rhodesian Security Forces loyal to Ian Smith’s regime during the ‘Bush War’, would tell me of the many times he was chased by chipembere (the name for black rhinos in the indigenous tongue) whilst on patrol in the Valley. One would have no option but to scramble up the nearest tree which usually proved to be covered in thorns, in order to evade the irritable creatures who would stomp around the base snorting and puffing until satisfied that the invader had been repelled. He had even had the head of a black rhinoceros tattooed on his shoulder in green ink in memory of those days. I saw it whilst staying with him in his little council flat in Plymouth, Devon, a few years back. We had also taken annual pilgrimages to the coastal city of Durban in South Africa. That stretch of coast was referred to as the East Coast, a stretch between Durban in the north to the vicinity of Port Shepstone in the south. Further south of that one would be in the Transkei, a largely undeveloped former homeland area of the country. Mostly we had stayed with my maternal grandparents in Durban itself, but on occasion we would spend time in holiday homes in coastal towns south of the city: a few days in Uvongo near Margate, another couple in a holiday home in Scottburgh. I can recall how much of an affinity I felt for the sea and the coast then, walking for miles along the yellow, sandy beaches where one could find shells, mostly scallops, and broken fragments of conch shells, incomplete but amazing to my young eyes nonetheless. Occasionally one would come across cuttle-fish shells, not really shells at all but their pithy, chalky, calcareous skeletons shaped like flint axe-heads. I had a particular love for birds from an early age and would sit for hours copying the pictures of familiar species from the field guides and books I had been given as birthday and Christmas presents. Inspired by birds seen in the vicinity of our home in Harare I had drawn a spotted eagle owl, woodland kingfisher and Senegal coucal. I can still remember the pleasure derived from copying the illustration of the owl from my old grey edition of the ‘Birds of Central Africa’ (in two parts), a musty smelling bird guide written decades before. Unlike the other bird books I had like Newman’s Field Guide and Roberts Birds of Southern Africa this guide included birds one could find further north in Zambia, Malawi and even the Congo; mysterious birds like Bannerman’s Turaco and flycatchers endemic to a particular forest in Mozambique. In Durban I copied a picture of the hadeda ibis, a distinctive and noisy bird and whilst in Scottburgh I drew a crested barbet, although it was the related black-collared barbet that was more numerous in those parts. I would come to view the barbet family with particular affection; quirky, intelligent birds with distinct calls and a sense of curiosity and boldness. We spent many a Christmas in Durban and many hours in the company of our cousins Ellysa and Matthew, who lived fairly close to our grandparents. They were my Aunt Liz’s children from her second marriage; her other two, Grant and Brett, were a few years older than me and from a previous marriage. Being a practising Catholic it had not been easy to get the marriage annulled, but her first husband had been an unsavoury character from what I heard and read, and she had eventually succeeded. I remember going to watch my cousin Brett playing in a rugby match on one occasion; he had been stretchered off with an injury, but had nevertheless derided the opposition and cheered his own teammates from the sideline. Dan and I with Ellysa and Matthew, stepsister and stepbrother to Grant and Brett. My father with a bevy of kids on the lawn of our grandparent’s place in Durban. My mother lights the candles on a birthday cake. Durban, South Africa. We all learnt to swim in the pool at my grandparents house in Durban. These plastic body boards or Boogie Boards as they were popularly known were a feature of this holiday and accompanied us back to Harare where we pulled them down the garden slope tied to the back of BMX bikes in lieu of ocean waves. Dan, Ivan and I posing in the surf of an unnamed beach, Durban, South Africa. Back in Harare I was a member of Borrowdale 2nds, a cub-scout troop. I really had enjoyed being a cub-scout, tearing around the yard outside the hall playing games of ‘hunter and the animal’ or in the hall itself where we had friendly competitions for which we were awarded beans (which accrued throughout the term) and had talks on aspects of bush craft and that sort of thing. There was also an annual jamboree held out at Ruwa Park where troops from all over the Mashonaland District would gather to compete in a plethora of competitions from knot-tying to seeing which troop could recite the Scout’s Motto with the most gusto. Ironically, it was the Highlands scout group that inevitably seemed to scoop the top prizes on offer. There leader (or Arkela) by a disciplinarian woman, Mrs Wilmot, who would later become my high school biology teacher. On the last evening we had all joined together for a huge game of ‘Jack, Jack shine your light’ where one of the scout leaders slunk off into the dark with a torch and the rest of us set off in hot pursuit as he or she flashed their torch when us boys shouted out the obvious phrase; a sort of optical equivalent of the swimming pool game Marco Polo. The highlight of my cub-scout career was being given an award by none other than Gerald Durrell, the famous English conservationist, who was visiting the country at the time and who was asked to preside over an awards ceremony at Christ Church, an Anglican establishment not far away from my house in Greystone Park. I had read many of Mr. Durrell’s books about his adventures growing up in Corfu in the Greek Mediterranean, so it was a real honour to shake hands with the man himself. In my enthusiasm I had hoisted myself straight onto the presentations stage directly in front of me, instead of walking sedately up the stage-side stairs like everyone else. I remember Mr. Durrell as a large, white-bearded, smiling man with a firm handshake. As a prize I had received the Mobil Colouring Book of Indigenous Plants, signed by both Gerald and Lee Durrell, which I never deigned to touch lest I spoil it. It resides in a box or trunk in Harare to this day. The church in question was later to become under the guidance of an Anglican Priest, David Bertram, whose three children had also attended Highlands Junior School. His son Matthew would become a good friend of mine after we had finished school. Richard, Dan and I are engaged by one of the Rhino Girls on the evening we were awarded our World Conservation badges. 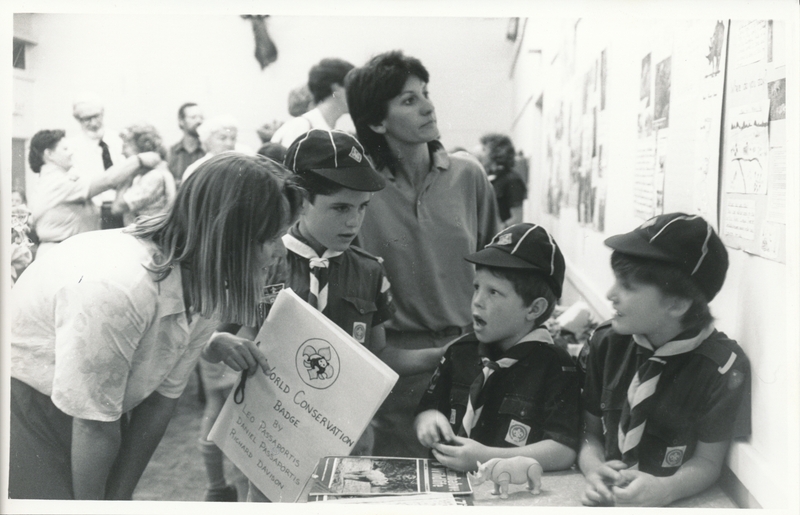 With my Brother Dan and Richard Davison, Celia’s eldest son, I set off to attain the World Conservation Badge, the cherry on the cake in so far as cub-scout achievement went. As with all my projects my mother was very involved and supportive. It was probably the efforts in trying to achieve this award that had nurtured my early conservationist spirit more than anything else: there had been indigenous trees to plant in our backyard and monitor closely; posters to draw and illustrate; articles to research and more besides. In line with one of the requirements, we had decided to try and draw attention to the plight of the rhinoceros’, both black and white, but especially the former whose population was decimated by years of poaching in the low-lying Zambezi Valley. The project was given an extra boost by a pair of campaigning women, known as the Rhino Girls, who had been cycling all the way from the UK, some 22 000 kilometres, to raise awareness as to the plight of the continent’s rhinoceros and funding for anti-poaching operations. They were there at the scout hall after completing their epic trans-continental cycle to present us our World Conservation badges. Some of the pictures which record our flattered and slightly embarrassed young faces had even made the inside pages of one of the national newspapers. From school I recall happy times amongst children of various colours and creeds. My parents sent my brothers and I to a local government school in a decent, middle class suburb of the city. Unlike other government schools which exclusively catered for the newly enabled black, working classes, Highlands Junior maintained an unusual mix of ethnicities, bolstered in part by the attendance of a number of children whose parents were diplomats or members of foreign businesses, aid agencies or the representatives of collaborative projects between well-meaning foreign donors and the new government. All of my friends would remember our days at the school fondly. Ben had gone on to take many of the academic prizes including the prestigious Dux Award for all-round academic prowess in their last year, Grade 7. Rivalries were generally friendly, certainly less intense than they would become at high school. Prize giving evenings were held as much for the benefit of the parents as for their blushing children. A picture of me in my Highlands School uniform (tie missing). Probably around Grade 6 or 7. Dan is awarded a book at end of term awards evening (2nd from left), Highlands Junior School. I receive the Tabex Encyclopaedia of Zimbabwe at an end of term awards evening, Highlands Junior. From Right: Ben Murray, Mike Alcock, me, Bronwyn Griffiths. Playing in the school orchestra on clarinet. this was the same evening as a performance of Joseph and his Dreamcoat which explains our dress-code. I remember playing in the school orchestra conducted by Mrs Di Wright, who, to the best of my knowledge, is still conducting school orchestras in Harare; learning the recorder from the kindly Mrs Bruce who had also been my very first class teacher at the Infants School; and singing in the school choir conducted by Mrs Reynolds, whose daughter Jessica was a pretty and popular girl later destined to become Mrs Highlands. I had been voted her male counterpart. The memory still elicits feelings of embarrassment, but it had all been fairly innocent and popularity was measured by a different yardstick at that age. Boys voted for boys and girls for girls and most classes would get together and agree to vote for someone in that class. It was common knowledge that I had only just held off Ross Brans who was the most popular boy in the second stream class which my Aunt Nick had taught. The school plays had been a lot of fun. We had performed Joseph and his Amazing Technicolour Dreamcoat in my final year. I had a crush on a brown-haired Finnish girl also in the play but remember that her affections were only for the star athlete of the year, a boy I simply remember as Tigere. I made the mistake of telling the class fog-horn, a girl called Nomusa Mbanga, of this crush. She had promptly broadcast it to the whole school. It made the last few weeks rather awkward because I was to learn, and not for the first time, that having a secret infatuation does not necessarily translate into a workable relationship. At our Leavers Dance evening I had selected Suzanna to partner me for the first dance, as was my entitlement as ‘Mr Popular’ of the year group, but the dance had felt awkward and embarrassing, my limbs wooden and clumsy. I do remember the two class jesters, Tom Newman and Ant Kashula, going to great lengths to try and impress the young Jess Reynolds. They had brought her bunches of flowers, professed their undying love and done a dozen other things to try and win her affections. It went to neither of them. I remember Tom inviting Carrie Sudlow instead, a tough-talking ‘mate’ from our class, who was quite pretty in her own way I suppose, but not really the sort you showered with roses. Carrie had managed to have me thrown into the lake at Geoff Cox Adventure Camp by one of the instructors, Heath, alleging that I had said something nasty to her. I remember her delight at the soggy results of her machinations. 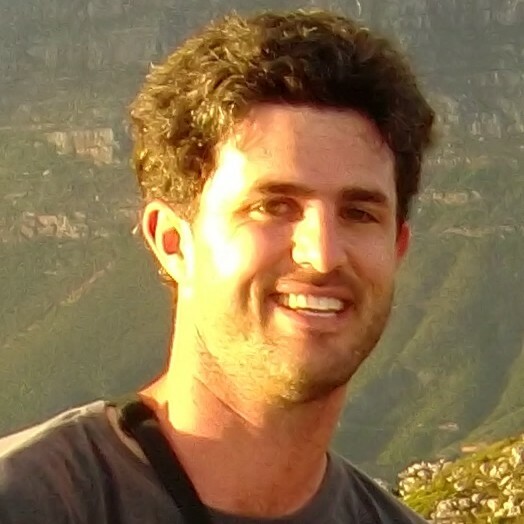 Tom emigrated to New Zealand after school but Ant still lives in Zimbabwe, running walking safaris in the Lowveld region. He always loved the bush and he and his father were forever going down to Lake Kariba on weekend fishing trips, something the rest of us boys were incredibly envious of. My clique back then consisted essentially of five or six of us boys: Ben who has already been introduced; Mike Alcock, son of an Anglican deacon; Brett Mead, bigger than the rest of us and a bit of a thug; Chris McManus, son of a farmer; Rohan Bruce, son of Mrs. Bruce the recorder teacher; Rowan Donahue, an Australian; and myself. Others like Tom, Ant, Ian Ullyett and Rob Brine would drift in and out of the loose circle of friends. There were occasional rifts like when I fell-out with Rowan about the money he was stealing off his mum to buy vast amounts of tuck which he literally used to buy his friendship with other members of the group. My relations with the girls of the class were amicable, except perhaps for Nassim Madjzoub, a pretty dark-haired girl whose parents were Persian I seem to remember. She sat next to me in class and had ensured that Mrs. Cockburn, our class teacher, knew my every misdemeanour. We played on the fields before and after school and during break times. A game called window was a favourite, whereby a tennis ball was kicked around until it went between someone’s legs. At this point it was a free-for-all for all those present and often a few spectators too, as the windowed individual dashed to touch some designated object like a tree or classroom door. I seem to remember Rob Brine having his arm broken one morning when a game got a little out of hand and Rohan Bruce was almost always on the receiving end during the games the group of us would play at break-time. It was usually Brett mead who would go in with a flying tackle at the crucial moment Rohan was in touching distance of the tree. There were tears and bruises and grass-burns, but Rohan’s desire to be one of the gang kept him coming back time and again. Ultimately it was too much and he had said something to his mum, we had all been called up before Mrs Cockburn and the game was banned outright. Years later, when I met Rohan after high school in Harare, he reminded me what ‘bastards’ we had all been and I had felt some measure of guilt. Still, Rohan seemed forgiving and we had laughed and reminisced about happier memories over a few beers that evening. I understand that he is a psychologist now, probably with a great degree more insight into the tortured mind of the pre-adolescent boy I imagine. There were athletics and cross-country days and swimming galas, which were well attended by the parents of the children. I was never a particularly good swimmer, except for the breast-stroke which I won narrowly from my cousin Dominic in my last year, although Dominic took the Victor Ludorum trophy as the best all-round swimmer. I remember that Mrs. Coventry, mother of Kirsty a few years below him, had expressed some faith that they could make a ‘decent swimmer of him yet’. She had been one of the assistant coaches and all Highlands pupils from that time, indeed Zimbabweans in general, would be proud of the achievements of her daughter Kirsty in the swimming pool in later years: two Olympic golds, four silvers and a bronze medal, undisputedly the country’s most successful Olympian ever. I did well at cross-country, with the encouragement of my dad who loved the sport and the training derived from the pre-class morning running sessions of Mrs Harnden, my Grade three teacher. Her son Kenny would go on and represent the country on the athletics track as a 400 metre hurdler. The excellent line drawings were made by a teacher called Dave Norris, an Englishman. This is a view of the main school block, Highlands Junior School, as seen from the old clay tennis courts. Another pen and ink drawing by Dave Norris of the hostel building, Highlands Junior School. The colts football team, Highlands School, 1991. That’s me in the bottom row, 2nd from left. Ivan was 5 grades down from me but the scenery was the same! Pictured here as a hockey goal-keeper (standing). Justin is kneeling at the back, 2nd from right. The other thing I remember well is the very strong sense of community fostered at the school. The various sports days aside, the school had regular family braais or barbeques which were sometimes augmented by a live band. A South African trio, the Blarney Brothers (of Irish stock, allegedly), made a couple of appearances on a makeshift stage set at the top of the school fields. Rows of sectioned fifty-five gallon drums filled with hot charcoal and overlaid with mesh grills were at hand for people to cook whatever meat they had brought along with them and drinks were served from tented stalls set up at various locations. Jumping Castles had arrived on the scene and these also became ubiquitous at such events. There was the opportunity to socialise and most of the boys and fathers engaged in informal games of rugby, football and garden cricket whilst daylight remained. Sometimes there would be a firework display organised for the children after dark and perhaps some music in the school hall. I remember sneaking over the fence surrounding the school pool and having an illicit ‘midnight swim’ with Dominic, Dan, and one or two others. We were careful not to splash around much and it was more about risking punishment and getting away with it than actually swimming. It would become something of a ritual I remember doing even after having left Highlands, when returning for family braai evenings because one or other of my brothers was still there at the junior school. Dominic was usually the one instrumental ensuring that the tradition continued. He kept his hair cropped short so with a few shakes of his head it was usually dry, unlike my own lank hair which would remain damp. I worried about being questioned by a suspicious teacher or parent but that never happened. When ‘The Cousins’, as we collectively called ourselves, met off the school grounds, it was to muck around the neighbourhood on our bikes ringing gate bells and causing minor mischief here and there. On other occasions we would light fireworks and hurl them onto the usually quiet suburban road outside, panicking pedestrians and causing the occasional car to come to a standstill. 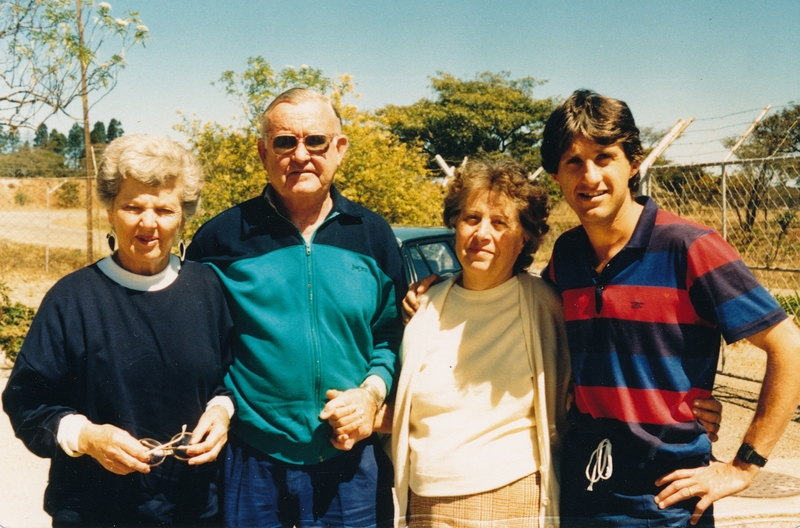 The best recollections of time spent together were of family Sunday lunches at the Marondera house with our Yia-Yia (grandmother in Greek). We usually drove out after 8 o’clock Sunday Mass, our cousins proceeding separately. Sometimes my father would grumble about having to go out there, citing better things he could do with his day-off, although once out there he seemed to enjoy himself. The extended family outside the front door of the family home in Marondera. An early shot of Dan and I with our new BMX bikes in Marondera. Ivan was still a baby (seen here with my mum) and obviously too young. A picture many years later on the same patch of grass as the picture at left. 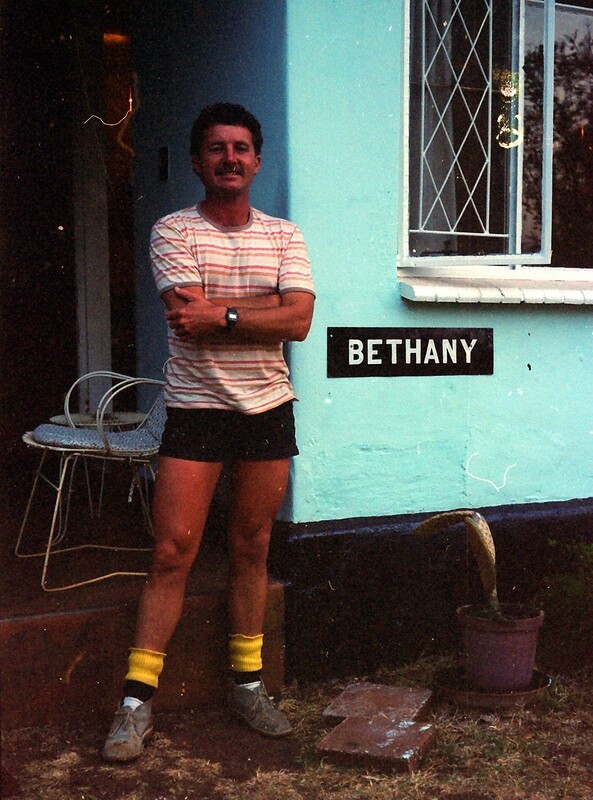 My father wore a stocking because he had suffered a thrombosis in this leg. I cradle a baby Lizzie who was to be a part of the family till my mother passed away and several years thereafter. I reckon she was about 16 years old when she died (human years). This was the house where my father Ray and his brother Tony had grown up. They were fraternal twins and they had three older siblings: Nadia, Monica and Byron. When we Cousins were little boys our great-grandmother had been alive (old Yia-Yia). She couldn’t speak a word of English having come out to Africa from Cyprus with her daughter after the latter married our Papou (grandfather) in the 1950s. Our Papou had been born in settler Zimbabwe, then Rhodesia, sometime in the 1920s but had gone back to Cyprus to find a wife. The old Yia-Yia had a kindly smile which showed her missing several teeth. I remember well her walnut-tanned skin, slight stoop, thin white hair neatly brushed back and her blue-veined hands. She would give us boys twenty and fifty cent pieces when the ice-cream man came cycling past the property in the afternoon, waving good-naturedly for us to make haste outside before he departed. The house itself had apparently been built by my grandfather, obviously with the assistance of hired help. Marondera was granite country and the soil was very sandy, unlike the red loamy soils of Greystone Park. The front drive we used as a soccer and cricket pitch and our own version of baseball when we were given an aluminium bat by one or other of our South African cousins. To the left of the sandy driveway, as one faced the front gate, were two concrete flamingos on rusty iron legs, one of which was stooped as if feeding from a pan or lake. Further back against the fence stood a mini-acropolis constructed of precast concrete pillars, deliberately etched and broken in an effort to imitate the original. The property was quite extensive and had some lovely trees I remember, especially the spreading wild Mobola Plum out front, which someone had dubbed ‘the lavatory tree’ because of the sickly sweet scent of the flowers, reminiscent of a lavatory air-freshener. In the garden we were able to extract camel worms, a sort of hairy caterpillar with two humps on its back, from their vertical holes with pieces of moistened grass. In the adjacent park area, if we were lucky, we would be able to dig up the occasional large, brown, hairy scorpion. I never saw one above surface but they probably came out of their burrows when it was cooler. Our Yia-Yia was an unapologetic horder of commodities, perhaps because of the tough war years she would have spent in occupied Cyprus. In her pantry could be found all manner of items, some decades old and probably a hazard to one’s health. Occasionally Ray or Tony would dig these items out and berate their mother light-heartedly (before discretely disposing of them). The house was always full of laughter and activity whilst we were visiting. The kitchen would become a focal point as the food was prepared by the bustling old lady on her old gas stove and old worn countertop which must have seen the preparation of countless meals over the years. The lunch itself was always something to look forward to. It usually started with a bowl of Avgolemono soup; pale with lemon juice, chicken bits and grains of rice, followed by the main course: moussaka, dolmades (small packets of mince wrapped in spinach or grape-leaves), pasta rice, very well oven-cooked lamb served with baked potatoes, and batter-fried salted cod. Old Yia-Yia as pictured in the ever-busy kitchen. The pantry behind her was a repository of items dating back several decades! My paternal grandfather or Papou at the dining table near the front door entrance. My paternal grandmother or Yia- Yia leaning against a bird bath in her front garden, Marondera. My grandfather, a life-long heavy smoker, had died of heart failure when I was only seven, so most of my memories of the house only involve my Yia-Yia (the older Yia-Yia had died around the same time). The house was always very neat and clean; there was leather furniture in the lounge-dining area and on the walls were two bugles and a bayonet, both relics of World War II, in which my grandfather had fought. Adjoining that room was a smaller area with another table on which the children would eat when the main table was full (it usually was). On the side of the white enamel cupboard nearby the heights of all the family, especially the kids, were recorded over subsequent years. There was also a splendid formal dining room joined to an entertainment room that was seldom, if ever, occupied. It housed an old piano. The furniture too was old and well-polished and made of a handsome dark hardwood of some sort and on the quarry-tiled floor was a Persian carpet. I remembered hearing my Aunt Monica playing that piano once and my cousin Sera playing a Polonaise; otherwise it was more ornamental than functional. Round the back of the house were the sheds and workshop where an assortment of bric-à-brac had accumulated over the years, which provided us boys with all sorts of curiosities from rusty hose-pipe fittings to old Anchovette bottles with the labels still intact. There were also kennels housing several large Rottweiler dogs, the largest and meanest of which was Shadow. My grandmother unleashed them in the evenings either there or at their leather factory nearby as a very successful deterrent to any prospective thieves. There was also a gate leading out to a communal area and an expanse of bare granite rock where our fathers had themselves played years earlier. They called it Pirate’s Rock, so we did too. It wasn’t much to behold but it was exciting to think that our dads had once been at the age that we were then and played the same games at the very spot on which we then stood. Despite what would later transpire to mar my relationship with my father, I remember him as a good storyteller when I was a youngster. He would spin a yarn about a mysterious and deadly character, the Black-Widow Lady, who had inhabited town and countryside, cocooning little boys like us in a spider-like thread that she spun before devouring them at leisure. These tales had held us rapt and begging for more after each instalment. My father had fostered a legend about a penknife he possessed which was the only known item capable of cutting the silk thread of the cocoons; this fabled knife was now lost but we spent hours and hours searching every nook and cranny of the house and garden in search of the mythical item. Our Yia-Yia had finally passed away shortly after my own mother had in the early part of the last decade. Until the final week or so of her life, when she needed full-time attention by my Aunt Nick, she had resided in that house where all her family memories from the last half-century had accumulated. It was her express wish that the family continue to use the house as a family holiday home, improbable as that may have been. Ray and Tony had consulted with Sera, then living in South Africa, who had inherited the property and decided to put it on the market. They rented it for a year or two and then sold to a black family. Looking back I can understand my Yia-Yia’s sentiments entirely and why so loathe to sell the home where I grew up. All the same, it’s best remember the place for what it was and not hanker for a past that’s irredeemable. It is enough to appreciate that places hold memories and memories bring a sense of continuity and belonging. Tony and Nick, Dan and his family all live in Harare now, but our ancestral home was that house in Marondera. From R to L: My mum’s parents, My Yia-Yia and my father. Taken outside Goksel leather factory, Marondera. A retrospective piece written a while back but no more (or less) retrospective than before! Basically about my childhood, growing up in Zimbabwe. I have enjoyd reading about your memories of your ancestral home in Marondera. As it happens, I have my own fond memories of the same place! Yes, same place. And the servants’ cottage was our home. That’s where I spent my entire early childhood. We played on the granite rock (paruware) and I never forget the day my brother and I chased a snake all across the ruware thinking it was a lizard!! I remember most of the Passaportis family. Most amazing of all was the fact that the old yiayia had her mother also at the house during the mid-60s. Wonderful to make the connection Grace. I will share your comment with other members of the family. Where do you live now? Thanks for your reply Leo. I now live in Harare (Hatfield). It would be wonderful to get in touch with other members of your family, especially Fiona – we used to play together when they visited. Hi Grace. Below is my uncle Ken’s email address. He is Fiona’s dad. I’m sure he’d be glad to communicate with you: kenmackay@intekom.co.za. My uncle Tony, recently emigrated to Australia, says he was in contact with you previously?